Nushagak Cooperative has been exploring plans for a hydroelectric generator at the Nuyakuk River for over a year. 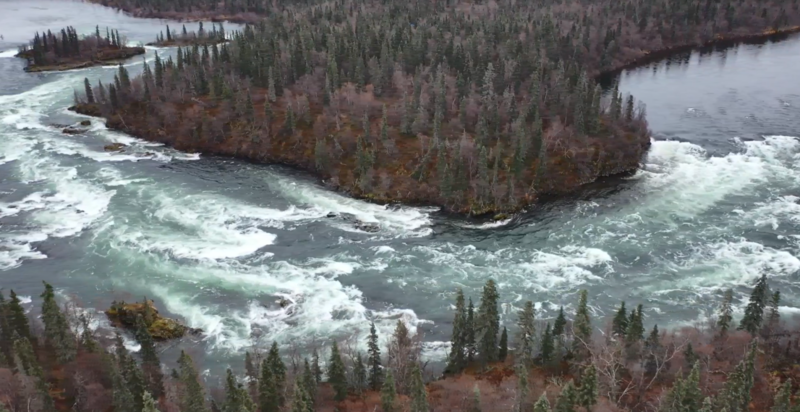 Last month, House Speaker Bryce Edgmon of Dillingham introduced House Bill 99, which would add Nuyakuk Falls as a potential hydroelectric project site in the Wood-Tikchick State Park's management plan. District S Sen. Lyman Hoffman of Bethel introduced a parallel bill in the Senate. The bill would allow the co-op to conduct a series of feasibility and wildlife impact studies on the area. To that end, the co-op has hired the engineering firm McMillen Jacobs. If the studies are promising, it could begin the lengthy process of moving away from diesel fuel altogether. At a hearing on the bill before the House Fisheries Committee on April 2, Nushagak Cooperative CEO Bob Himschoot explained their goal. “We want to go study this potential hydro site, see if it is feasible, both environmentally and financially, for development. And if it is, use it to move the region off of diesel,” he said. The United States Geological Survey has monitored Nuyakuk Falls since 1953. Himschoot said that based on that flow data, the site’s potential power production could exceed the energy needs of co-op members. Initial designs for the hydroelectric generator would divert a quarter of the river’s water to a power production facility below the falls. That would produce around 72,000 megawatt-hours each year. Currently, cooperative members use a quarter of that amount – around 18,000 mWh annually. 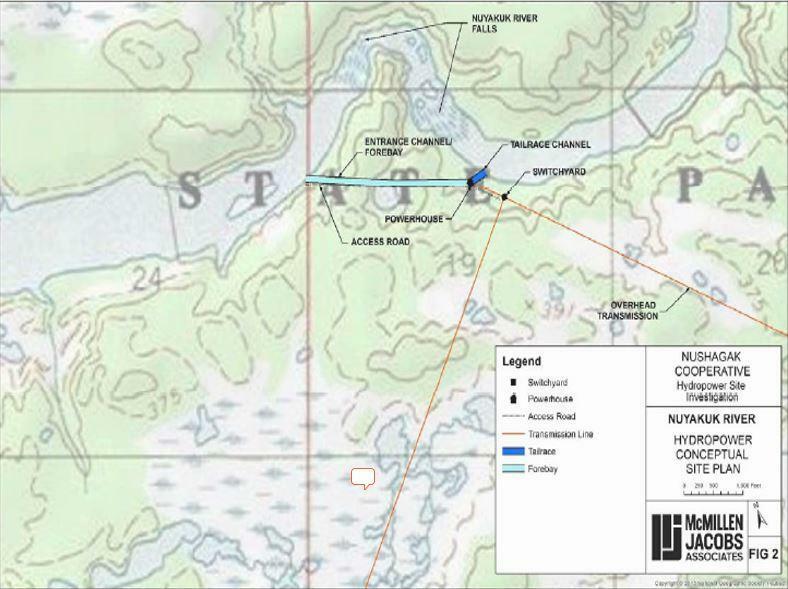 A conceptual plan for a hydropower site at Nuyakuk Falls. Because the generator would sit on the river, output would naturally increase during the summer, when more power is required for salmon processing. It could also significantly lower energy costs. Right now, residents who purchase energy from Nushagak Cooperative pay around 17 cents per kilowatt-hour, compared to this January's national average of around 12 cents per kWh. The co-op's estimates take Power Cost Equalization into account; the state pays part of rural residents' electric bills through that program. Costs are more for businesses and for homes that use more than 500 kWh per month. The financial impact the project could have on the region was not lost on committee members at the hearing. Committee Chair Rep. Louise Stutes of Kodiak pointed to the benefits renewable energy projects have brought to her district. Committee members also inquired into the generator’s effect on the surrounding environment. Himschoot said that situating the project by the falls means that it would have a minimal impact on the fish that swim there. “We use 25 percent or less of the flow, if that’s what the studies show was available, you’d have 75 percent remaining in the natural course of the river. So the salmon return, the transverse of the falls, both from adult salmon and from smolt, would use the same passage they always had,” he said. If the studies pencil out, the co-op would sell electricity to Ekwok, New Stuyahok and Koliganek. It currently provides electricity, telephone and internet service to Dillingham, Aleknagik, Manokotak, Clark’s Point, Portage Creek and Ekuk. The total cost of the project is estimated between $120 - $150 million. Overall, according to the co-op the project could save more than $300 million in fuel and maintenance costs over a 40-year period. Nushagak Cooperative has received preliminary permitting from the Federal Energy Regulatory Commission. If the bill passes, the studies will take about three years to complete.